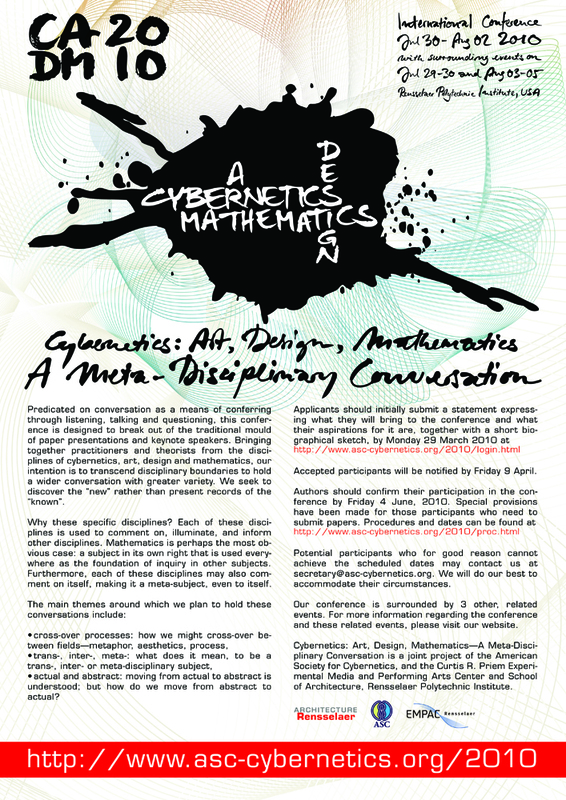 Members of the ASC (American Society for Cybernetics) will be able to attend a special, private meeting of the ASC before the main event, the conference Cybernetics: Art, Design, Mathematics — A Meta-Disciplinary Conversation (C:ADM2010). The ASC meeting will be held at EMPAC from 9am on 29-Jul-2010 till lunch time on 30-Jul-2010. This meeting will have a program that will be largely determined by members, as usual, allowing the sort of close personal interaction that ASC members value and enjoy. ASC members are used to proposing talks and workshops. We welcome such proposals for the ASC meeting and will schedule them to the best of our ability in the limited time available. The ASC General Business Meeting will also take place at the ASC meeting. There is no charge for the ASC meeting, and ASC members may opt to attend just the ASC meeting although we expect you will want to attend C:ADM2010 as well. The organizers hope that, since there is no charge, members may wish, instead, to contribute to a fund to help students and young people attend. More about this later. The ASC meeting will be co-ordinated by Stuart Umpleby. Details will be announced on this page as well as on the C:ADM2010 Facebook page, and may also be noted through a RSS subscription to this web site. You are welcome to make suggestions for the ASC meetings to Stuart. Application for a place in the ASC meeting will open in the spring, but you can start planning and sending in suggestions now. Please watch this space for information.